Historically speaking, the Solo River has been the most important waterway in the Indonesian island of Java. The river, locally known as Bengawan Solo, plays an important role in trade and agriculture by transporting fertile volcanic soil downstream and providing link between Javanese port cities. Its legendary status is cemented by the song “Bengawan Solo” written by Gesang, which describes the river in a poetic and nostalgic way. Lately, a cloud has been hanging over the future of river. Its water used to be crystal clear, but now it has become polluted and turned yellowish. The river stream used to be strong, with the song describing the river as “flowing far away to the sea”. But now, the water is dry due to climate-induced drought. Late last year, the city of Surakarta (the official name of Solo) which relies on the river for its water supply, faced a water crisis as there’s not enough water from the river. As many as 12,000 people had to stand in line to receive clean water supply. And in the future,17 million people — a population the size of the Netherlands — who live on the Solo River’s bank might have to get used to seeing the river water dries up as climate change is predicted to decrease the river water debit by exacerbating drought. The situation of the Solo River is a perfect example of how climate change can have a profound impact not only on the environment, but also on all aspects of life in Indonesia. When the Solo River is dry, trading ships can’t travel through the river, farmers’ crops are failing and households don’t have access to clean water. So when the two candidates for this year’s Indonesian presidential election, incumbent president Joko “Jokowi” Widodo and Prabowo Subianto, squared off during a televised debate on February 17, people expected them to put climate change at the top of their agenda. First, the topic of the debate was on environment, energy, infrastructure, food and natural resources, all of which are closely tied to climate change. Second, climate change itself is one of the greatest challenges of our time. Third, Indonesia is the fifth largest emitter of greenhouse gases. But apparently, none of those facts matter as neither Jokowi, who hails from Surakarta, nor Prabowo said anything about how they’d like to tackle climate change and curb global warming. And while both hopefuls have mentioned climate change in their vision and mission documents, none of them cared enough to elaborate on that during the debate. The fact that neither candidates, one of whom would lead a rapidly-growing economy that’s also a major contributor to climate change, talking about climate change doesn’t bode well for global climate goals. Despite being the fourth most populous country in the world and the fifth largest greenhouse gas emitter, Indonesia is often overlooked when it comes to climate issues, receiving little global attention compared to other major emitters, like China and the U.S. The archipelagic nation only appears on the radar once in a while when intense fires rage across the country almost every year, mainly due to slash-and-burn clearances for agricultural and industrial purposes. During a particularly bad fire episode in 2015, forest fires in Indonesia raged so bad that the toxic smog blanketed Singapore and Malaysia, angering the neighboring countries and sickening half a million people, according to government figures. The emissions from the 2015 fires exceeded the average daily emissions from all U.S. economic activity in a day, despite the U.S. economy being 20 times larger than Indonesian economy. But as rain puts down the fires, the public interest on Indonesia also flames out along with it. That being said, people might want to look closely at Indonesia in the future. Its emissions have already increased at a faster rate than previously as its economy continues to grow. In 2012, Indonesia produced a total of 1,453 gigatonnes of carbon dioxide equivalent (GtCOe), an increase of 0,459 GtCOe from the year 2000, according to the first Nationally Determined Contribution (NDC) Indonesia submitted to the United Nations. And while Indonesia has set a target to reduce its emissions by 29 percent by 2030 compared to business as usual level, its emissions are actually predicted to double by that time when compared to 2014 under current policy projections, according to an analysis by Climate Action Tracker. A 2017 study by the World Resources Institute (WRI) shows that if Indonesia follows through on existing policies aimed at reducing emissions, the country will only reduce its emissions by 19 percent in 2030. And even if Indonesia succeeds in meeting its emission reduction target, it’s still highly insufficient to holding global warming to below 2 degrees, let alone limiting it to 1.5 degrees Celsius as required to prevent catastrophic climate impacts. Climate Action Tracker has predicted that if all countries were to follow Indonesia’s climate policies, warming could reach up to 4 degrees. There are two main reasons why Indonesia’s emissions will continue to rise beyond what’s needed to limit global warming to “safe” level. One is the ongoing deforestation and the annual land and forest fires. They’re currently the biggest contributor to Indonesia’s emissions. In fact, Indonesia is the largest contributor of global forest-based emissions, responsible for a quarter of the world’s total land-use and forest-based emissions. 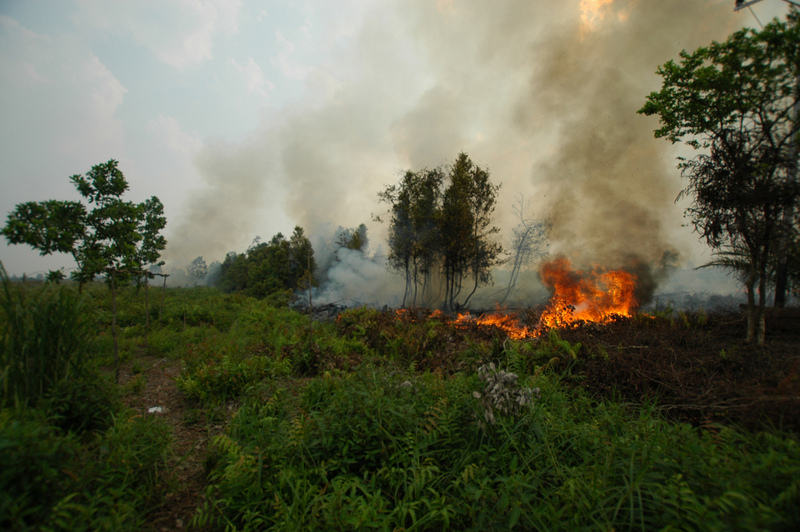 The reason is because the majority of fires in Indonesia occurs within tropical peatlands, which the country has an abundant of. Indonesia is home to 36 percent of the world’s tropical peatlands, more than any other country. These areas store some of the highest quantities of carbon on earth, accumulated over thousands of years from decaying dead plants. When they are drained and burned, the carbon gets released into the atmosphere, which leads to huge spikes in greenhouse gas emissions. Since the 2015 fires, both deforestation rate and the annual fire episode have declined in intensity, thanks to the combination of increased government measures to combat fires as well as longer wet seasons. The 2015 fire episode razed 2.6 million hectares of land across Indonesia. In 2016, 438,363 hectares of lands were burned. The size of burning areas dropped again in 2017 to 165,528 hectares. This drop has enabled Indonesia to reduce its emission by 24.4 percent compared to business as usual scenario in 2017 because the forestry sector, including peat fires, is currently the biggest source of emissions in Indonesia, contributing 47.8 percent of the country’s total emissions.Therefore, reducing forest fires, especially those burning on carbon-rich peatlands, will go a long way in reducing Indonesia’s emissions. However, after declining for two years straight, 2018 saw a significant uptick of forest fires, with 510,564 hectares of lands scorched — three times the size of area burned in 2017 — as that year’s dry season was more intense than the previous two years. According to data from the Indonesian Ministry of Environment and Forestry, peat fires in 2016 emitted 96.7 million tons of CO2. But from January until August 2018, emissions from peat fires had already reached 76 million tons. This goes to show how Indonesia couldn’t afford to rest on its laurels. 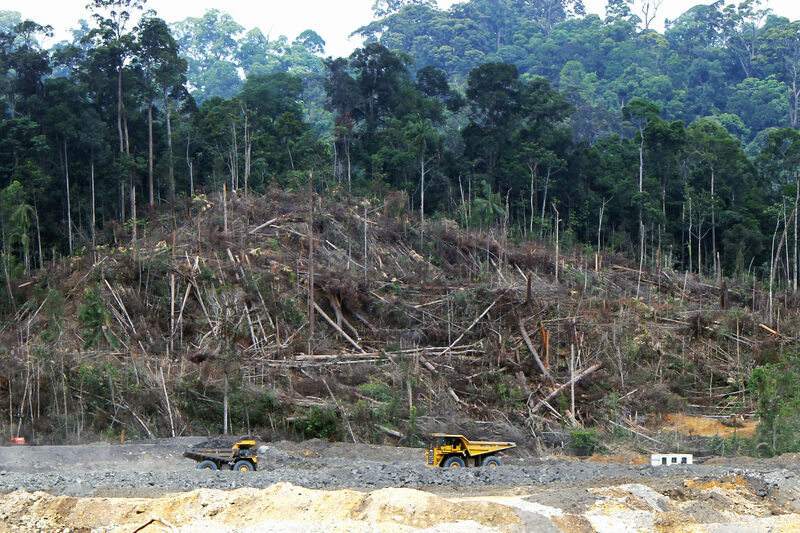 Even as the Indonesian government has started some initiatives to cut emissions from the forestry sector, such as a moratorium on new licenses to clear “primary” forests and peat swamps as well as a plan to restore some 2 million hectares of degraded peat swamps, climate researchers have estimated that Indonesia’s forest-based emissions will continue to rise over time. A 2017 study by NewClimate Institute estimates that emissions from forestry sector in Indonesia will increase at least 300 million tons of CO2 between 2020 and 2030, mainly driven by continued expansion of large-scale oil palm plantations. Indonesia is already the biggest producer of palm oil in the world. In a bid to meet its emission-reduction target, it is currently pushing for increased domestic consumption of biodiesel that contains the vegetable oil. The policy calls for a minimum bio, or palm oil, content of 30 percent in all diesel sold in the country by 2020, up from the current requirement of 20 percent. This makes its biofuel target among the most ambitious mandates in the world. If achieved, Indonesia’s annual biodiesel consumption would rise to 18.6 million tons. An analysis by think tank Coaction Indonesia shows that Indonesia’s domestic palm oil demand will increase threefold by 2025 if the 30 percent target is made mandatory. This huge increase in demand will require an expansion of 4 million hectares of oil palm plantations. The government’s data shows there’s 14 million hectares of degraded lands in Indonesia, about the size of England. And according to Indonesia’s NDC document, the country has to rehabilitate almost all degraded lands (12 million hectares in total) in order to achieve the 29 percent emission-reduction target. Since oil palm plantations can only be established on already-degraded lands in Indonesia, where will the government finds suitable lands for the oil palm expansion needed to meet the biofuel target? Will they move oil palm expansion to regions still rich in virgin rainforests like Papua region, which has been dubbed as the last frontier of intact forest in Indonesia? Unfortunately, the answer seems to be yes. The government and businesses have in recent years eyed the country’s easternmost region as a new frontier ripe for plantations, primarily oil palm, which have already nearly depleted the forests of Sumatra and Kalimantan, the Indonesian part of Borneo. In a particular area in Papua, a vast stretch of land which spans 280,000 hectares, nearly five times the size of Chicago, has been earmarked to become the world’s biggest oil palm plantation, according to a joint investigation by Mongabay, The Gecko Project, Tempo and Malaysiakini. While only 2 percent of the land has been cleared, the plantation is poised to contribute significantly to climate change as it will release as much carbon as Virginia does annually by burning fossil fuels if the entire area is cleared as planned. The second reason is the energy sector, which is on pace to overtake the land-use sector as Indonesia’s biggest greenhouse gas emitter. Emissions from the energy sector are estimated to make up 58 percent of Indonesia’s emissions in 2030, up from 34 percent now, according to the country’s NDC document. This is because Indonesia strives to become a developed country in the 2030s, and thus it will need much more electricity to power its economy. In the next 10 years, Indonesia’s electricity demand is predicted to increase by 7.1 percent each year, reaching 443 Terrawatt hours (TWh) in 2027. But unlike other major economies like India and China which have started to move away from fossil fuel to renewable energy to develop their economies, Indonesia plans to rely on fossil fuels, especially coal, in foreseeable future. Indonesia is one of the world’s biggest producers of coal, and also one of its biggest consumers. According to data from the research group CoalSwarm, a total of 39 units of coal-fired power plants are currently under construction in Indonesia. Another 68 have been announced, of which 15 are in the process of obtaining environmental approval. The Indonesian government has estimated that coal will still generate 54.4 percent of the country’s electricity in 2025, even more than the initial 50.4 percent previously planned. The Indonesian Ministry of Energy and Mineral Resources even said that coal would remain as the main source of energy until 2050. This makes Indonesia’s energy policy out of step with global trends where renewable energy has overtaken coal. There are at least 21 countries which have already committed to phase out coal plants before 2030. Some financial institutions have also announced that they won’t fund coal projects anymore in the future. In the Southeast Asian region, while coal investments have decreased in most countries that are still planning coal additions, Indonesia continues to increase its investments in coal, with large coal investments also coming in from China and Japan. This unbridled addiction to coal spells disaster for Indonesia’s greenhouse gas emissions. Coal-fired power plants release more greenhouse gases per unit of energy produced than any other electricity source. That makes the burning of coal the single biggest contributor to human-driven climate change, accounting for 46 percent of CO2 emissions worldwide and 72 percent of greenhouse gas emissions from the electricity sector. The government’s answer to the environmental concern of coal-based energy is the so-called “green coal” technology. Green coal technology advocates for the improvement in the efficiency of coal burning and the capture of the gases SO2 and NO2, which are common byproducts that are harmful to the environment surrounding the power stations. Therefore, the Indonesian government has touted this technology as the saving grace for its reliance on coal. While the most advanced technologies can, in theory, remove some 90 percent of carbon and harmful particulates from coal exhaust, they will drive up the cost of building a coal-fired power plant by about 70 percent. In some cases, the cost can even ballooned by a factor of 15, making these technologies prohibitively expensive, according to a new study by Greenpeace on the economic feasibility of fossil fuel energy and renewable energy in Indonesia. Not all is doom and gloom though. For one, the Indonesian government has a plan to decarbonize its economy through the low-carbon development initiative (LCDI). Announced in 2017, the LCDI is an initiative spearheaded by the Indonesian national development planning ministry (Bappenas) which integrates sustainable goals and climate change objectives within the country’s upcoming five-year development plan. The idea behind the LCDI came after the Bappenas realized not only that climate change would wreak havoc on Indonesia’s environment, it would also harm the nation’s economy, taking out as much as 20 percent from the nation’s Gross Domestic Product (GDP). During the launching of the initiative in Bali last year, the national development planning minister, Bambang Brodjonegoro, said “the government of Indonesia has committed to become the pioneer of sustainable development by initiating the LCDI”. Later on when Bambang presented the LDCI at the 24th United Nations climate talks in Poland, he admitted that a transition to renewable energy was the only way for the country to have a sustainable economic growth in the future. “If we don’t focus on low carbon development, we cannot continue this growth,” he said. Besides the LCDI, the Indonesian government also has a plan to review its NDC document this year. The plan was announced by Indonesian Environment and Forestry Minister Siti Nurbaya Bakar earlier this year. She has also ordered the ministry to conduct a study on what Indonesia should to make sure that global warming doesn’t exceed 1.5 degrees, instead of 2 degrees. The ministry’s official in charge of climate policies, Ruandha Agung Sugardiman, said the minister ordered him to conduct the study to assess how Indonesia could review its NDC earlier and make it more ambitious based on a landmark report by the United Nations’ Intergovernmental Panel on Climate Change (IPCC). According to the report, even if countries fulfilled their Paris Agreement commitment to voluntarily reduce emissions, the rise in the earth’s mean temperature would still exceed the 1.5-degree Celsius limit. Furthermore, countries only have until 2030 to prevent catastrophic climate-driven consequences from unfolding by limiting the global temperature rise below 1.5 degrees Celsius. While there are some initiatives on the pipeline to improve Indonesia’s climate plans, the recent presidential election debate has casted doubts over the government’s commitment in tackling climate change. During the televised election debate, both Jokowi and Prabowo said they’d like to reduce the country’s reliance on fossil fuels. But despite Indonesia blessed with abundant sources of renewable energy potential, such as solar due to the country having plenty of sunshine throughout the year, neither mentioned them as parts of the solution. Instead, both candidates said they would like to reduce the country’s overdependence on fossil fuels by promoting the use of palm oil as bioenergy. Both said they’d like to continue the current government’s policy of requiring palm oil to be mixed in all diesel sold in the country. President Jokowi even said he would like to have all diesel to have 100 percent palm oil content in near future, without considering the costs of doing so, such as the amount of land needed to produce enough biofuel to replace oil. At a time when the young generation increasingly voice their frustration at the older generation’s inaction on climate change, both Jokowi and Prabowo’s silence is deafening. Recently, more than 10,000 young people in at least 60 towns and cities walked out of classes to join a U.K.-wide climate strike fueled by growing anger at the failure of politicians to tackle climate change. The school strike movement started last August when Greta Thunberg, then 15, held a solo protest outside the Swedish parliament. Now, up to 70,000 schoolchildren each week hold protests in 270 towns and cities worldwide. 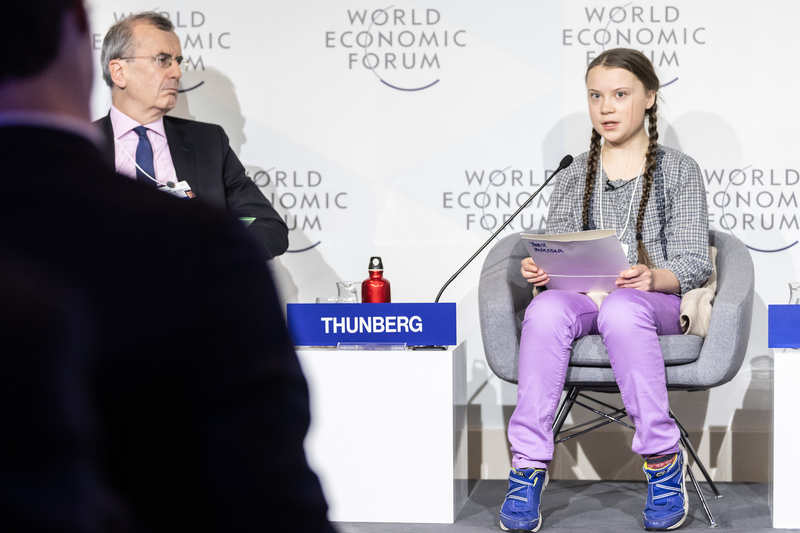 If a shy teenager from Stockholm like Greta could understand that we’re living on borrowed time and inspire countless other young people to follow her lead and take action on climate change, then what excuse does the future leader of Indonesia have to keep acting as if we still have decades to solve climate change?